'Buying a violin, cello,or viola on eBay ... ?? The large online market offered by Ebay is not a safe place for the inexperienced musician, violonist, cellist who wants to buy his instrument or bow online. Violins, violas, cellos and bows are difficult to judge by vision alone without a great deal of experience. We recommand only buying an instrument or bow wich has a certificate from an international leading expert. There are many many ebay sellers who are selling NEW INSTRUMENTS as OLD and antique ! We have even seen fake violin bow certificates, and fake violin certificates on Ebay. These fake new made instruments are hard to judge by the inexperienced ebay buyer. I have the inpression that Ebay doesn't do anything against this kind of sellers ... Don't look for the lowest price if you buy on Ebay - cheap instruments may need so much in repairs that the cost will offset any preceived savings. why they're selling, and how to reach them. A real store with legitimate return policies, accurate descriptions, and fair prices (not too low, not too high) is likely acceptable. If you know how to buy on eBay, you could be fairly safe, but only if you are very inexperienced. 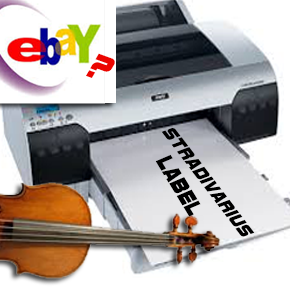 We do not recommend buying a violin, viola, cello or bow on eBay. Stick only with reputable online dealers.